A practical, properly functioning kitchen is essential in any home. Whether you use your kitchen as a dining space too or simply to cook and prepare meals, chances are you spend a good portion of your time at home in it. Whether your kitchen is big or small, there are plenty of ways to create an efficient and orderly space that you enjoy spending time in. Getting rid of anything that's not essential, and creating designated areas for different things in the kitchen (ie, pans, baking equipment, tupperware) will go a long way in helping you keep an organised kitchen. If you have a drawer of accumulated junk, get rid of it and use the space for something else (we all have a junk drawer somewhere in the house- just move it somewhere the space isn't needed as much!) If you have a smaller kitchen and don't have a whole lot of cupboard space, consider putting up shelves and arranging things into baskets. There are plenty of kitchen space saving ideas out there, from under cupboard hooks to magnetic spice racks on walls- get creative! Keep countertops for items you use daily, any other small appliances can be put away until you need them. I have a fairly large cupboard in my kitchen that houses the gas meter and boiler, instead of it just being wasted space I've put up shelves on the walls and turned it into a pantry/ storage area. Think carefully about the room and use the space you have wisely. 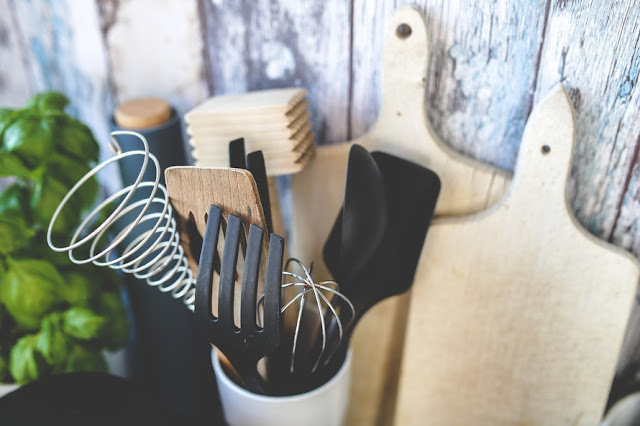 There are so many pieces of equipment and accessories that are needed in a kitchen, and so it's worthwhile keeping everything else as simple as possible and sticking to the essentials with decor. One or two key decorative pieces like a plant or vase of fresh flowers should do the trick, and will stop the room from looking bare without taking up lots of room. In order to bring some personality to the kitchen you could accessorise with items that are useful and practical such as cute tea towels, mugs, a gingham tablecloth etc. A tired looking kitchen can be freshened up for less money than you might think. If the units are still in good condition, simply replacing or upcycling the doors can completely change the look of the room. I did this recently in my kitchen and it was so much easier than expected, I simply scraped off the old veneer on the doors and repainted them white using special kitchen cupboard paint. Along with some new handles it looks so much nicer and completely modernised! Simply replacing the taps, or the entire sink if yours is looking tired is another way to bring everything up to scratch. From a practical point of view, adding a grease trap is worthwhile too if you're making changes to the sink and can prevent expensive plumbing issues later down the line. If you're looking to replace worktops, materials like granite and marble are a good choice as they'll never go out of fashion, speaking to a specialist kitchen company such as Mowlem & Co will give you plenty of ideas.